Nigerians on twitter got no chill at all and I am surprised how far Nigerians can go just to show love to politicians, these same politicians that impoverished us. I found these tweets and decided to share. So a twtter user with the username @Ibn_NaAllah posted: "This government has failed completely, nothing to show. I spent 4.5 million campaigning for them... when do i get to send my account number for refund:? 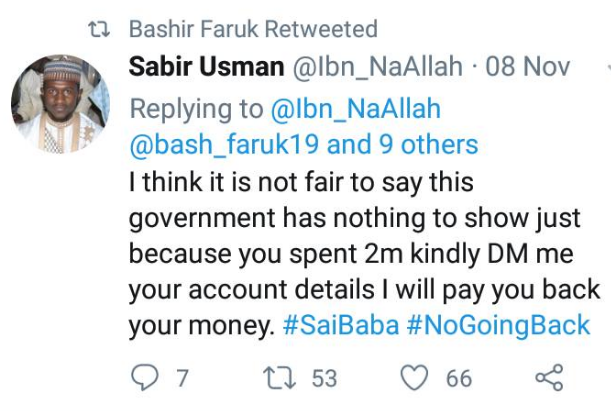 A fanatical supporter of Buhari replied saying: "I think its not fair saying this Government has nothing to show simply because you spent 2M, kindly DM your account details and I will pay you back your money. #SaiBaba"
You know what stunned me? The initial poster went to the guy's DM to demand the money and he got N1M transferred to him instantly by the Buhari fan. Where are the Buharists oh?